Anyone here remember the Riverview Park Air Scouts?. I started off in the cubs in Riverview first then moved on to join the Air Scouts. We met initially at the scout hall near St Aidan's Church (must have been about early 1970s), then moved up to the scout hut at Shorne. We always seemed to be raising funds for our own scout hut, although it did finally get built on Riverview, I never got to see it! Happy days! Like alec ludlow and medwayboy I was in the 17th Medway (West) cubs and scouts. I remember medwayboy as a patrol leader when I “went up” from cubs to scouts, and during my first scout camp that was held at Kingsdown (Deal) in the summer of 1959. During my time with the troop, we camped at Hole Park (Rolvenden); Knowle Park (Sevenoaks) and again at Kingsdown. I only remember camping at Buckmore Park once, during my time with the cubs, and that was a joint camp with the 32nd Medway (West) and in hut accommodation rather than under canvas. I believe I’m correct in saying that the Group Scout Leader was Ernest Ravenscroft (Ernie) with his wife (Vi) as “Akela” and at one point a daughter assisted her at cub-pack meetings. I thought that the Ravenscrofts lived in Lester Road - I can remember going to a house in that road which I’m sure was their home, and my 1963 Kelly’s directory shows what seems to be the “right” Ravenscroft family at the address that I recall. Thank you so much for your comments on the picture of Vi Ravenscroft. I had forgotten her first name but instantly recognised her on the photograph. I know this is an old post but I've been living abroad for 3 years. I've rejoined the forum, but delighted to see some of my old posts are still showing. Invicta Alec a.k.a. Alec Ludlow. As I'm new to the Forum, " surfing" is quite interesting. In 1942-45, I was a scout, then senior scout, in the 43rd Medway ( Gillingham County School- now I believe the Howard School at Rainham, do they have a troop?). Six patrols ( I have a photo' of us all marching in the Victory celbrations at Chatham in '45). I was in the Kingfisher patrol ( Swift yet Sure); Pete Kentsbear P.L., Ken Everet Second, " Lucy" Locket, John Boulter, John Noble & self. Scout master was Bob Browning who took us for History. Camping in Hoath Woods, Wigmore ( & getting flooded in the middle of the night!) with regular "damper & twist" competitions in Tank Woods, at the bottom of Darland Banks. In Spring '45, all seniors of Medway Troops were at the R.E. Bridging Camp at Wouldham for a week end of competitions. Happy days. Across the road in 3rd Avenue there was an Air Scout Troop at St. Pauls church. I have read through the postings on this site with interest and sometimes found them to be somewhat wrong with names and dates etc. However that's usually age related! So can be forgiven. As an ex scout and scout leader of the 24th Medway (Borstal), starting as a cub in the 1940's and leaving as a leader in 1990 I have met almost all of the people named in these articles. I am surprised therefore to find the name of James (Jim) Lees as a former Scout Leader of the 17th Medway West has not been mentioned. Especially with regard to KHF. Jim was without doubt an 'Individual' when it came to leaders. Irreverent would be the best way to describe him and it was my pleasure to have known him and worked with him. Now we come to his Kent History connection. Sometime in the 1980's I was contacted by Jim who asked; would I like to join him and his troop on an outing to the Greenwich Maritime Museum. Picnic in the park and a tour of the said museum. I duly accepted his kind offer and one Sunday found myself sitting on the grass eating curled up cheese sandwiches and drinking cold tea from a clapped out flask whilst Jim was perusing the young ladies as they strolled by and awarding points out of 100. Most were in the 90 points range! Having finished the 'bird watching' Jim said; "Follow me" and away we went but not to the front entrance as would be expected. No! A side door which would not be noticed was approached and Jim knocked loudly on the door which was opened and a gentleman, almost bowing and scraping said; "Good afternoon Mr Lees" with which we were ushered into the holy of holy's, the workshops of the Maritime Museum. There were rigged ships awaiting restoration, some in excess of six feet tall. Ships of the line awaiting re-rigging and others awaiting the bin. But what were we doing here was what I asked myself at that time? All became clear when I asked "Jim what the devil was this all about?". "Well" he explained, "I am the model maker for this museum, at the same time neglecting to tell me he was not only the model maker, but the head model maker for both the Greenwich Maritime Museum and the Victoria and Albert. And as I found out that very evening on a trip to the pub; one of the most famous of authors on rigged ships of the last 600 years or so. I was telling a mate about my trip out and he said;" Not James Lees who wrote books about rigging" and I said probably, in my ignorance not realising his importance. And he replied " you lucky bugger!". Lucky I may have been, but when you are given a whistle stop tour of the Maritime Museum by such an expert, it is not the same as walking round on your own. We passed case after case of wonderful models which Jim indicated were rubbish! And every so often we were allowed to stop and admire a model which Jim reckoned;" First Class"! But I had a smashing time and was shown round by the most famous of men without realising it. I thought he was Jim! So lads; any of you who were members of the 17th Medway. You don't know the half of it! Check him out. In fact his books are still selling. The 44th Medway West did indeed meet at the hall attached to St Andrews church on the corner of Rose Street. I graduated from cub scout to boy scout in the 1960's and the senior scout master was Charlie Salter who lived in Catherine Street. Fortunately, because Charlie was a strict disciplinarian most of the meetings were taken by the amiable 'Skipper Cook' (Cooks hardware on the Delce) Four patrols of six was the norm so twenty four lads 'playing' British Bulldog in that small hall would now have 'elf and safety' bringing charges. I often limped home down the Delce Road from these meetings although my elder smaller brother remarkably always remained unscathed. Happy days. St Andrews corner of Rose Street & Cossack Street may be. 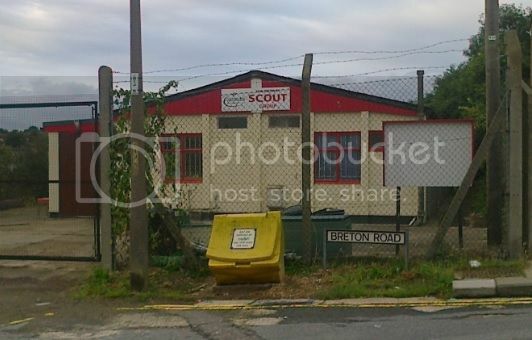 I am pretty sure that you are referring to the meeting place of 44th Medway West scouts. Scoutmaster in 1956 was a man by the name of Salter, assisted by a very large chap named Bill Rapley. There was a song we used to sing, "We're The Delce Road Boys", anyone know the full version? I can only remember a small amount of it. I was a member of the Cub Pack at St Andrews in the mid fifties. British Bulldog was the first thing after the opening ceremony. The idea was to get the excess energy out of our system. When at the age to be vetted to become a scout, myself and two others were invited to a scout meeting where British Bulldog was played. We were not invited back, "as we did not play British Bulldog in the right spirit" ?. We thought the idea was not to get caught. Was Ray Salter the name of the Scoutmaster. A Sevenoaks troop (21st I think) for me back in the early 1970s. British Bulldog was "in" and played in a very small church hall with lots of lovely hard surfaces, although I don't recall anything worse than injured pride. We also played it at school during PE - very much a blood sport on a par with rugby which at least had rules. More deadly were the "wide games" played during the summer in Knole Park - two patrols a side and minimal umpiring given the area involved. The aim was to find the other side's base and capture it, ideally setting off the firework rocket you found there. Other delights included canoeing, the expeditions alluded to by others - patrol leader pointing out the 10 mile cross country route to us two 10-11 year olds on the map with his jack knife while covertly dragging on a cigarette - and the discovery after two weekends camping out and cooking on a wood fire that chicken isn't one of those meats best eaten "rare". At the time you were at Third Avenue, around 1963, was the Scout leader a shortish weedy guy who used to play a guitar in a pokey little room, sometimes with another chap with a guitar who soon became an assistant leader? My memory is not so good lately but he may have been the Cub Scout leader. If so the other man was I. At the time I lived in Beatty Avenue and it was just a few minutes away from the Church. I seem to remember the short guy tended to take his guitar more seriously than his Scouting and I certainly remember duetting on guitar with him in the Baptist Church youth club in Green Street and the just round the corner in St Marks youth club. As for games, British Bulldog for sure and in Seniors - Chalk Rugby. A circle drawn at each end of the room, a small piece of chalk in the centre - blow the whistle and 'game on' First team to put a cross in the opposition circle won! 28th Medway corner of Breton and Copperfield Rd's Rochester. I joined the 44th Medway West in May/June 1956 when I moved from Margate to Rochester. The Skipper was a Mr. Salter, so it must have been the Charlie Salter in the last message. The first time that I attended he picked me up from my home in Rochester High Street and took me to the Scout Hall on the back of his Motor Scooter. I well remember going to camp at West Farleigh, all equipment loaded into the back of a removal lorry, we then all climbed in and sat where we could on top of all the equipment. What would Health and Safety think of this!! 44th Medway did indeed start their life at that location. We are now located in Castle Avenue off Delce Road in Matthews Hall. We are still going strong and have approximately 60 children in our care. We still camp out at West Farleigh and can be found there on the last bank holiday in May. I believe the location was found by Charlie Salter going out on his bike looking for suitable locations within a decent walking distance. The boys would then load everything on hand carts and walk out there, have their camp and walk back. How true this is I don't know. I'm sure you would be able to put me right on that. We also still have a photo of Charlie Salter and John Cook, up in the hall. It's nice to read on here from past members about the history of the group I've been with for the last 15 years, I would love to hear more. .
Google ‘Boy Scouts in World War 2’ and 'Girl Guides in World War 2’ and there’s lots of information. Thanks for that Peterchall, and OldMuzza, a very nice story, well told. However, the directory shows several Ravenscroft families as living in that general area, including two in Mills Terrace right where Peterchall’s wife remembers them so I wonder whether the family she remembers is possibly not the same as the family involved with the cubs and scouts. Related possibly? The photograph of “Akela” and two helpers running a stall at a cub event was taken around 1957/8. I remember going to two events, one of which was held in the grounds of the old rectory on New Road (which I think was where this photograph was taken) and another in Frindsbury that I think was held in the church grounds but I could easily be wrong on that. District Commissioner Whitehead’s fore-name was, I think, Cecil (rather than Cyril). My memory of him was that he “failed” my “First Class Hike” – one of the tests towards a scout’s “First Class Badge”. This particular test involved a hike covering around 15 miles over two days and included an overnight stay under canvas with the participants (the candidate usually travelled with another scout who was not taking the test) having to be self-sufficient, carrying tent, food, water, cooking equipment etc. The route of the hike was dictated by the examiners, and navigation was via mandatory way-points that were either places or map-references, so map reading was a key skill that was tested. The route was usually not particularly local to “home” – mine was around Cuxton, Halling, and Trottiscliffe whilst the previous week I had accompanied the scout who accompanied me on his own hike that was in the Shalmsford Street – Chartham area near Canterbury. Some tasks were set that had to be performed. At the end of the event, the candidate had to write a log of the event which was sent to the District Commissioner for evaluation. DC Whitehead failed mine – there was nothing wrong with the narrative of the report – simply that there were insufficient sketches of “items of interest”. The lack of sketches was hardly surprising as I couldn’t draw to save my life then and still can’t! I wasn’t going to walk the route again just to make some very bad drawings to make the man happy, so I ended my days as a scout (school exam time was looming!) as a second-class citizen, never achieving the First Class Badge. Although I never fully forgave him, he wasn’t wholly responsible for my not achieving that coveted award before leaving scouts – being able to swim was another test and I still can’t do that either!